Boston Comic-Con 2014 is in the books, and it was the biggest one yet, as thousands and thousands waited in lines for hours to get in, and as far as I could tell, everyone who passed by my table was having an amazing time. 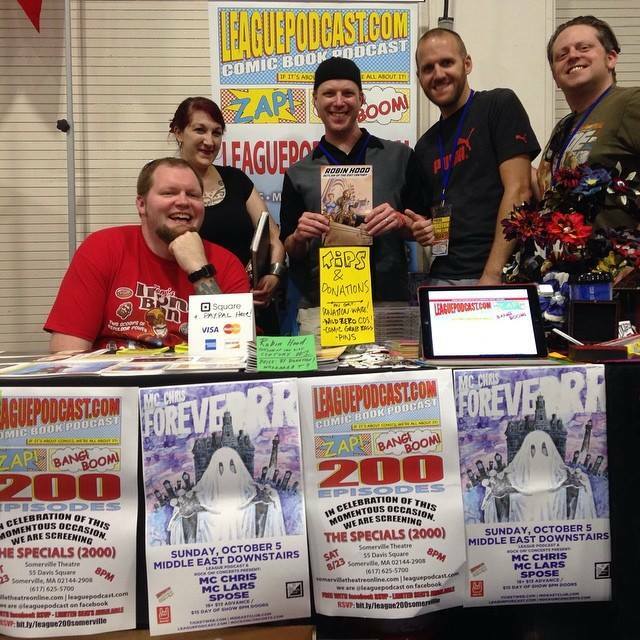 My League of Ordinary Gentlemen Podcast mates and I were able to spread the word to the masses, and even managed to record an episode during the madness that was the convention. The one drawback for me was that I wasn’t able to sell as many copies of Robin Hood as I wanted. It’s obviously not about the money, and I can say with much pride that those that did buy a copy seemed to think it was pretty cool,so that’s awesome. But with the thousands and thousands of people there, I was hoping to move a few more. But I understand. It’s hard to compete for people’s entertainment dollars with that guy from Buffy. Here’s the funny thing; as happy as everyone is that all these comic book movies and TV shows are out there to soak up, there is a group of comic people who think that it’s not so good. These people think that these johnnie-come-lateleys don’t really understand, and will never understand, why this stuff really is cool, because to these newbies, it’s kind of just a fad. While I don’t agree with them, I do kind of understand their point, because on Saturday, I watched literally thousands of people walk by my table and not buy my little comic book. I kept thinking, “They don’t want this book they’ve never heard of. They want a Groot action figure.” And who could blame them? Not me, certainly, because I myself purchased a Groot action figure! But is it because of this market saturation that I didn’t sell more comics? I don’t think so, because there is certainly enough room for all of us in the industry. But it does change the game somewhat. Before you think I’m getting all sad panda, though, let me say that I did have a fun time, a lot was accomplished, and it was a tremendous learning experience. And let me say thanks to everyone who came by the Leaguepodcast table and a special thanks to those folks who I made “promise” to listen to the podcast in exchange for a grab bag of free comics. I’m gonna hold you to that! The guys and gal of the League! I have debated buying my own domain name for years, and pointing to my old Google blog, but financial reasons and the fact that I didn’t have a lot to say always deterred me from doing it. Well, I finally went and did it (even though I still don’t have much to say.) In case anyone was wondering what I’ve been up to lately, well, I went and did a crazy thing; I created a comic. I was able to do with thanks mostly in part to the kindness of others. Specifically by raising the money via Kickstarter. One of those kindnesses was being allowed to hype the project on a website called Forces of Geek when I was asked to write a guest column chronicling my adventures in crowdfunding. In case you missed it, I am re-posting here as the initial post on Mattdursin.com, just because I love you (and because I don’t have anything else to say. Weren’t you paying attention?) If you prefer, you can find the original here. ———————————————————————————————————————————————————– Kickstarting a Dream: Robin Hood: Outlaw of the 21st Century As far back as I can remember, or at least since that live-action Flintstones movie that almost ruined John Goodman’s career, I railed against Hollywood to make something original. Sure, once in a great while, something like Inception or Manos: Hands of Fate would come along and restore my faith, but mostly, a look at the top-grossing movies of all-time reveals that a lot of films are made from previously-created material. Of course, take this all with a grain of salt, because it’s coming from a guy who likes a lot of comic book movies. Despite my cravings for original content in movies, in 2009 I came to find myself in a Comics Experience: Introduction to Comic Book Writing class, in which students were forced to pitch to teacher and former Marvel and IDW editor Andy Schmidt, an idea for a 5-page comic story on the very first day of class. Using my vivid imagination and drawing on my long history of comic-reading, I came up with… an idea about a guy writing a comic book. Andy quickly (but politely) cast that crap-tastic idea aside and urged me to have something better by the next class. Under the gun and not trying to sound like an idiot any more than I already had, I started to draw from a screenplay that I had been hammering away at for a while about a guy who lives in a small town and robs pharmacies and gives the medicine to the townspeople who can’t otherwise afford it. The idea came partially from my own dealings with the health-care system in this country (For the record, I never robbed a pharmacy. Quite the opposite, in fact.) and from one of my favorite childhood stories, ever since the Disney animated adaptation: the story of Robin Hood. So, not quite as original as I had hoped. Then again, there are supposedly only 36 dramatic situations. Armed with this inspiration, I hammered out my five pages, to rave reviews from my classmates and even Andy himself. Upon finishing the class, several of us decided to get our stories illustrated and combine them into an anthology book (appropriately titled Out of Our Minds: Tales from the Comics Experience.). Seeing my five-page script completely drawn, inked and lettered, I was emboldened. Why not keep it going? I would only need seventeen more pages to have an honest-to-God comic book story. Even I can handle that, right? Well, as it turned out, I could handle it, and thanks to my screenwriting background and the skills and techniques I learned in the class, Robin Hood: Outlaw of the 21st Century soon became a reality. Well, sort of. Believe it or not, writing the comic was the easy part. The funny thing about funny books is that they need to be drawn, inked, lettered and colored (even the black-and-white ones). Even with the first five pages complete, I would still need to get the other seventeen. Still, I felt I had a viable, marketable idea, especially when Sherlock came along, and I realized that maybe everything old can be new (and good) again. So, I pressed on. Fortunately, the same artist I had hired for the initial five pages was still available, and willing to finish the book. 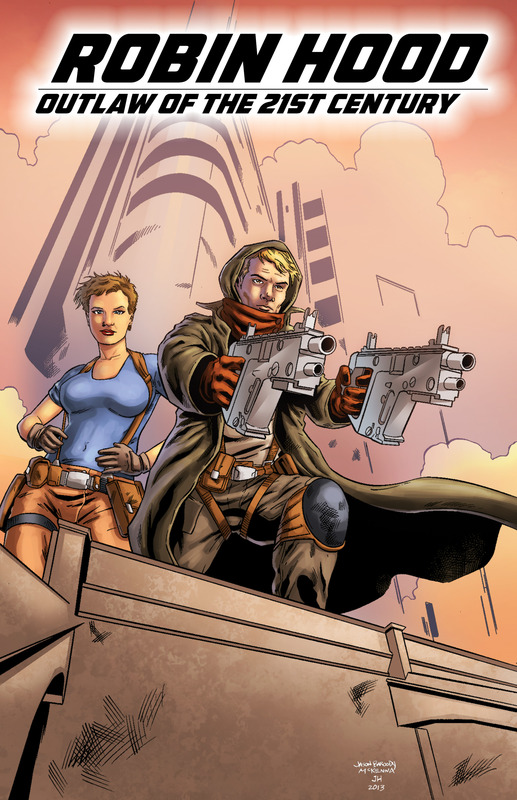 Then, I contacted comic veteran Mark McKenna about drawing the cover, we worked out a deal where I would donate to his Kickstarter, and instead of receiving a commission as my reward, he and artist Jason Baroody (Combat Jacks) would create my cover image. All the chips were falling into place. Except that I still had to pay for it all. (Issue #1 cover by Jason Baroody & Mark McKenna) Thankfully, I could also turn to that crowd-funding site that all destitute creative people go to for help, Kickstarter. A friend of mine had used Kickstarter to get his salsa recipe in stores, and if he could do it, I could, too. So, I gathered my courage, made a ridiculous video, and launched. It was by far the scariest thing I have ever done. The first few hours saw a lot of my amazing friends donate. In a couple days, word began to travel, and a few kind strangers pledged. Even Mark McKenna, who was already paid for his work, donated. Then, days passed and nothing happened. And my anxiety rose. Taking my salsa friend’s advice to “whore myself out,” I pasted the link everywhere I could think of. I emailed co-workers and old high school buddies, and even started “cold-calling” (via Twitter, Facebook and Google chat, not actually talking on the phone) people I hadn’t seen in years, and slowly, I was creeping closer to my goal. As I write this, I am roughly one-third of the way to the end, with a little over two weeks left. I am cautiously optimistic that I will get there, but even if I don’t reach the goal (in which case, I don’t get a penny), Robin Hood: Outlaw of the 21st Century will be a comic book. It just may take a little longer. Hopefully, by the time it is done, Hollywood hasn’t put out its own version by then. Of course, this is only the beginning of the journey,and anyone interested in “donating” post Kickstarter, you can buy a copy of Robin Hood:Outlaw of the 21st Century #1 over at RobinHoodComic.com. In fact, if you did, that would be awesome!